Lemala Camps proudly announces the arrival of their new northern Serengeti permanent tented camp, “Kuria Hills”, which opens in July 2013. What is undisputedly the best location within the Serengeti National Park, this 10 tent camp has been designed in such a way, that not only is it an eco-camp, but also harmonises perfectly with its surroundings. Situated on the main corridor of the world-famous wildebeest migration and just a stone’s throw from the Mara River, Kuria Hills tented camp offers guests the opportunity of witnessing this magnificent event at its very best. The public area of the camp also utilizes the magnificent views to their full extent. A bar, inside sitting areas, dining, gift shop, swimming pool, outside deck area with tables and chairs all make up the main area where guests can relax and dine in comfort. In keeping with the architectural design of the camp, the interiors follow a contemporary take on a tented safari camp. The colors chosen give an accent to the sand colour canvas and coco brown floor. These colors also incorporate the rich colours used by the Kuria tribe The fabric selection used throughout the camp for furnishing and curtains are natural cottons and linens and are all of natural tones. Artefacts used throughout the camp were sourced from Tanzania and neighbouring regions. A focal feature of the accommodation units is a collection of portraits taken during a traditional Kuria ceremony. All furniture has been custom designed for the camp and ranges from contemporary, rustic to ethnic and many of the pieces where hand crafted locally. The bar has been designed on 2 levels to allow guests a picturesque view of the Serengeti. The boma is set against a beautiful rock face which is lit up at night creating magnificent shadows. The boma has been furnished with rough turned logs for side tables and contemporary canvas leather and steel campaign style chairs. 10 custom built standard tents. The unique design is based on sound, globally recognized and accepted environmental principals, which ensure the lightest footprint possible. The materials which have been selected in the construction of the units, are a mix of recycled steel, glass, sustainable timbers, composite decking and canvas. The tents are very spacious at 70 square meters and all are stylishly furnished with a contemporary design, making them comfortable and homely. The double rooms offer grand super-king beds whilst the twins have two three quarter sized beds. The entrance into the unit is from the back through an entrance hall, which affords the guests privacy when inside the tent. From here, one enters into the bedroom and sitting area. Each unit comprises a sitting area, bedroom, bathroom, dressing area, outside deck area and outside shower. Bathrooms are spacious with double basins, WC, shower and bath. Extended shade net awnings over the front decks of the tents provide additional shade, keeping them cool. All tents are also fitted with ceiling fans. 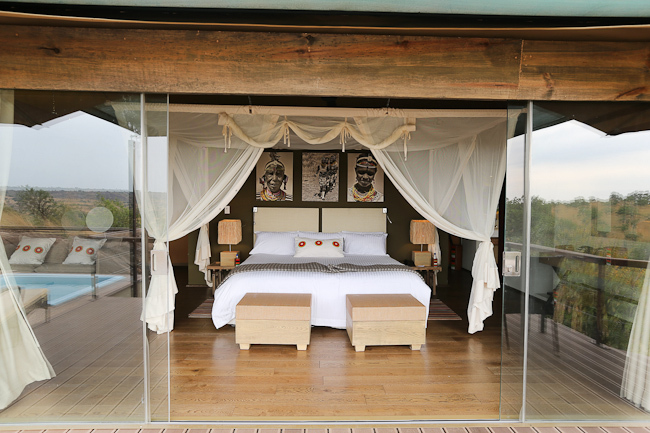 The full front of the bedroom section comprises sliding frameless glass windows, which enhance and accentuate the magnificent panoramic views of the Serengeti. The sitting area has a luxurious feel with beautiful sofas and ottomans into which guests can sit back and relax. From the sitting area, guests look out through glass sliding doors onto uninterrupted views of the Wogakuria Hills and the game as it passes by the camp. The concept of the large glass fronted areas, has been carried through to the bathrooms. These have been designed in such away that there is a view from each and every angle from within. From the double basin vanity, a mirrored image of the view can be admired. The glass shower walls also allow a view. Whilst relaxing in a hot slipper bath, enjoy the beautiful vistas through a full length window, next to which the bath has been positioned. Outside showers are also special features of the units. Dramatic features such as large boulders, small kopjes, big and gnarled fig trees, have all been selected and used to form an intrinsic part of the outside shower. The substructure of the unit floor is made from recycled rolled steel, onto which beautifully crafted timber floors have been laid. These engineered floors all come with global accreditation, certifying that the timber has been sustainably and responsibly harvested. Composite decking used from recycled materials, have been chosen as the material for the external decking. The outside deck has a wonderful under cover sitting area where guests can enjoy the solitude and the views from the coolness of the shade. Even the colour of the canvas has been cleverly chosen so that the camp forms part of the environment and blends perfectly with its surroundings. Every unit is equipped with its own private plunge pool, which is sunken into the deck. Guests can cool down in sparkling water and relax in their own private pools and enjoy the breathtaking views. A plated service comprising a choice of two starters, three entrees and two desserts will be available at lunch and dinner every day. High tea will be served in the afternoons. The breakfast menu will offer fresh fruits, cereals, yoghurts, and a traditional English or continental breakfast. Bush dinners, bush breakfasts, tepanyaki, wood fired pizzas, barbecues and wine tasting are some of the various food experiences to be enjoyed at the camp. Go out and explore the Serengeti on foot or in open four-wheel drive safari vehicles, with knowledgeable and experienced guides. Indulge yourself with a manicure, pedicure, massage or aroma treatment at our African treatment center which has been strategically positioned to accentuate the experience. Lounge around the beautiful swimming pool and soak in the magnificent views whilst sipping cocktails. Sample wines from a large selection in the underground wine cellar. All of the game drive vehicles are new-model 4 wheel drive Toyota Landcruisers. All are equipped with refrigerators, inverters (producing 220 Volt power supply), first aid kits, HF radio sets as well as fly switches, binoculars and blankets for each seat. The vehicles are specially modified to enhance game viewing. The Serengeti hosts the largest concentration of wildlife in the world, and is home to one of the great wonders of the natural world, the Great Migration. Over a million wildebeest and some 600,000 zebra move through the eco-system, with lion, leopard, cheetah, hyena, wild dog and crocodiles making sure only the strongest survive. The sheer volume of numbers combined with the daily dramas of life and death make this an unforgettable experience. Far away from the beaten tourist track, the Northern Serengeti offers the unique opportunity to explore the fantastic Serengeti National Park undisturbed. Off-road driving is still allowed in the some parts of the northern Serengeti – unlike in the rest of the park. Endless rolling plains and riverine woodlands are home to lion, leopard, cheetah, elephant, and large herds of antelopes amongst many, many others. The stunning Mara River filled with hippos and crocodiles, cuts through this land and hosts one of the greatest spectacles of nature: the dramatic wildebeest migration. Between mid July and November, the Great Migration typically visits the area and crosses the Mara River back and forth in search of green grass. From June to November,the greatest concentration of animals can be found in the Central Serengeti. This valley offers varied landscapes as well as a high density of game year round. Here you can enjoy a magnificent balloon safari. From December until the end of March, the migration is in the Southern Serengeti and Ndutu area. This is the area of endless grasslands where lion and cheetah find perfect hunting grounds. This is a magical time, during which the Great Migration takes over the Ndutu plains. It is on these plains, during these months, that the wildebeest give birth to the next generation. The Serengeti eco-system is much larger than the Serengeti National Park itself, as it includes the game controlled areas bordering the National Park. Bordering the Serengeti to the east is the large Loliondo Game Controlled Area. This area is known for its Maasai culture, its spectacular natural beauty and for its variety of animals. Suyan Camp operates in Loliondo through partnership agreements with the Maasai villages. The Loliondo land offers unique freedom of movement to undertake adventurous activities such as night drives and walking safaris. The large, private concession areas, which are shared with small settlements of the nomadic Maasai tribe, offer breathtaking landscapes. The towering Gol Mountains, the deep Sanjan and Olkarien Gorges and the active Ol Donyno Lengai volcano are some of the geological wonders. Ancient rock paintings can be found, showing that there was life before the arrival of the first Maasai warriors. Adventurous walking safaris, fly camping, day and night drives, and visits to small Maasai settlements without meeting other tourists – these are what makes a visit to Loliondo a true and intense experience.